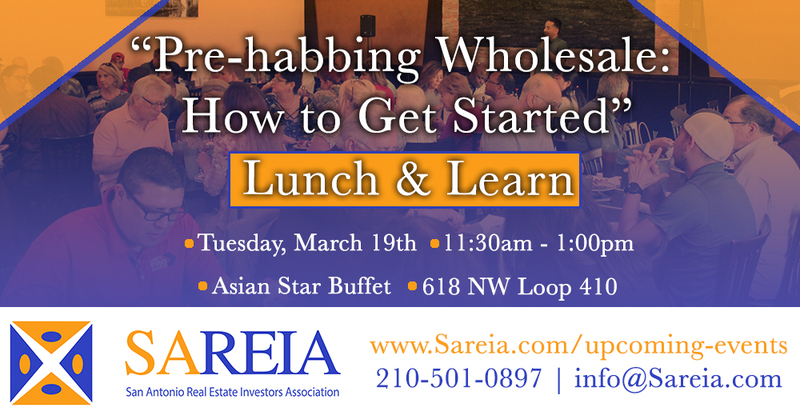 San Antonio Real Estate Investors Association - Lunch & Learn - "Pre-habbing Wholesale: How to Get Started"
Lunch & Learn - "Pre-habbing Wholesale: How to Get Started"
Location: Asian Star Buffet - 9919 Colonial Square *address in graphic is incorrect. Real Estate attorney, investor, broker and president of SAREIA, Victor Maas. As many of you know, Victor has been investing in Real Estate over 15 years. In addition, Victor has closed 100's of transactions ranging from Sub-2 deeds to full blown rehabs. Please join us as we discuss the most popular exit strategy for real estate investment properties, wholesaling. Wholesaling houses is a great way to make a LARGE amount of money in the shortest amount of time. Wholesaling is something every investor should know how to do because that builds the perfect foundation for your investing career. We will discuss what properties should be wholesaled as opposed to being flipped, what "prehab" should be done to wholesale property, and much more!